This recipe today is called "Carrot-Cake Sandwich Cookies". I love love love carrot in baking and this treat is SOOO GOOD! 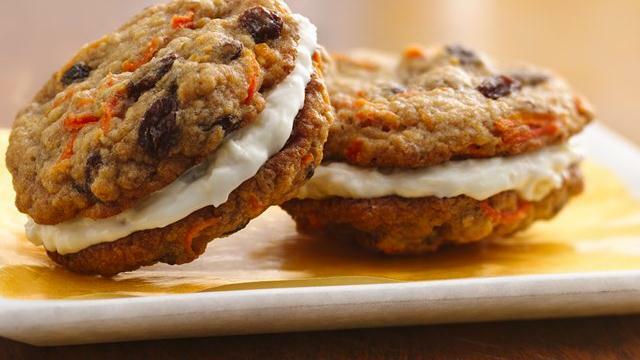 Treat your family with these carrot sandwich cookies made using Pillsbury® Ready to Bake!™ oatmeal raisin cookies and filled with cream cheese-pineapple mixture - perfect for dessert. Let cookie dough stand at room temperature 10 minutes to soften. Meanwhile, heat oven to 350°F. In large bowl, mix cookie dough, flour and carrots until well blended. Shape dough into 24 balls; place 2 inches apart on ungreased cookie sheets. Bake 13 to 17 minutes or until golden brown around edges. Cool 1 minute; remove from cookie sheets to cooling racks. Cool completely, about 20 minutes. In medium bowl, mix filling ingredients until well blended. To make each sandwich cookie, spread about 2 tablespoons filling on bottom of 1 cookie. Top with another cookie, bottom side down. Store between sheets of waxed paper in tightly covered container.